Such very beautiful lighting on these magnificent chess pieces! what a cool shadow shot!!! thanks for hosting!!!! Love the shadows produced by the playing pieces! Great shot! Love your haiku as well! Ooooh! Aaaaah! What a COOL shot! Looks like all are ready to play. Nice shadows. Imposing shadows! Great shot. I've posted a bit early. What a terrific shadow shot for the day! I do love the beautiful chess pieces! Thanks for hosting! Have a great weekend! If you could delete link 25 that would be great. I posted the wrong link there. Your Haiku is so on target about chess. I'm grateful for this meme, thanks for hosting. I LOVE this shot. So imposing. The black couch in the background adds to the mood. My great grandson would love this sight. He loves chess and is very good at it. He is 8. Excellent shot of the chess pieces and your haiku is perfect for the image! Let me know what all is involved with being a "stand-by" host. I'd like to do that! Toby you reminded me we should have bought a beautiful marble set like this while we lived in the Netherlands .. some markets had them at great prices .. yours is gorgeous and the haiku was perfect ! Very cool shots of the chess shadows! 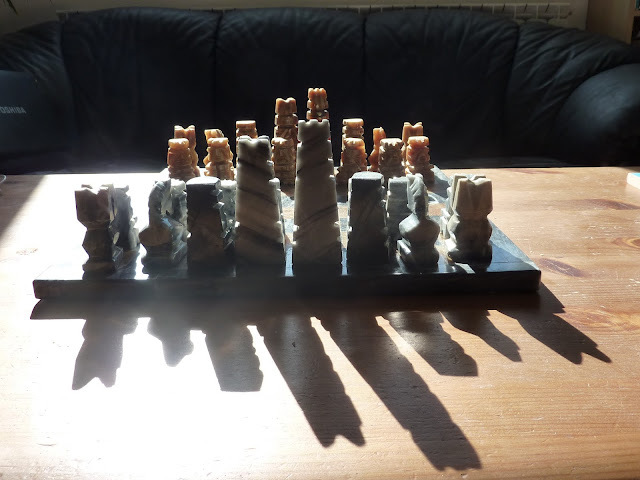 So dramatic—these chess pieces look like they're ready for battle! very cool shot! i wish i knew how to play chess ... yours is a beautiful set!